We’re dog people, but recently we met a cat that really impressed us. 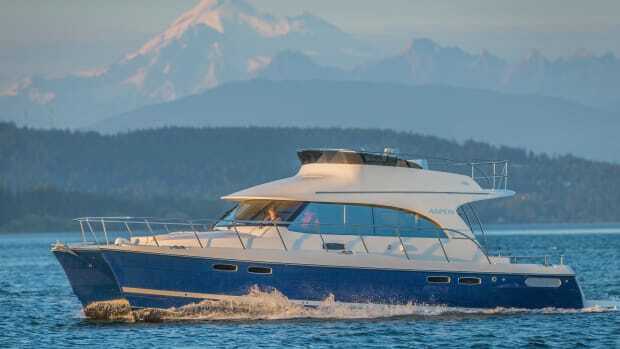 While at Trawler Fest in Anacortes, we were invited to sea-trial the new Aspen C100 power catamaran. Between seminars we snuck out to the docks and introduced ourselves to Larry and Nick Graf of Aspen Power Catamarans to learn about this new and interesting creature…er…cruising cat. The Grafs were quite eager to convert us to their concept of a single-engine power catamaran. As we toured the boat, we began to see a lot of different and innovative ideas. Could we really become cat people? The first innovation takes a keen eye and a bit of nontraditional thinking: only one engine in a two-hull catamaran—not a twin hull, as the port hull is about 35 percent smaller than the starboard hull, where the engine can be found. From behind the Aspen C100&apos;s use of a single engine is particularly apparent. Believing a single-engine catamaran could be powerful enough to push through Pacific Northwest seas and continue on to the Inside Passage and Alaska, Larry came up with a fantastic design that feels right. But you need more than feels right, right? Those of us without engineering minds might struggle with the concept of how this asymmetric craft produces a straight and steady ride. All we can say is, “Believe it,” and we did when we sea-trialed the C100. This boat has a great ride, and the absolute seaworthiness is there. You’ll feel it. We promise. Dogs that we are, we started sniffing around this cat by taking a careful look at her proa design at the dock. (“Proa” is a foreign word to most of us, but hold tight—we’ll get to that in a jiff.) 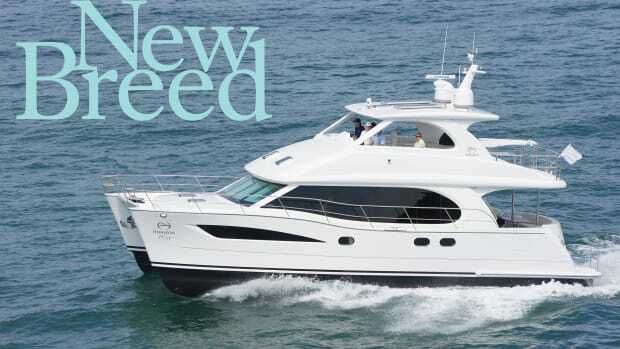 She has a large, open aft deck and a noticeably broader portside walk-around, making access to the bow easy. The tighter foothold on the starboard side is still wide enough for any mate to manage line handling when locking or docking. The engine, a 220hp Volvo D3 diesel, is easily accessible via the aft deck starboard hatch, with two options: the regular daily access hatch for fluid checks with two twist locks, and a larger hatch opening for oil changes and service. The port deck hatch compartment is empty (no engine!) and has the capacity to store almost anything. The space is impressive. The dash comfortably holds a full sweet of electronics below large windows for spectacular visibility. Enter the main cabin from the aft deck looking forward toward the helm station, and experience wide-open visibility—port, starboard, forward, aft. Amazing sight lines. You can see everywhere, with no appreciable blind spots. 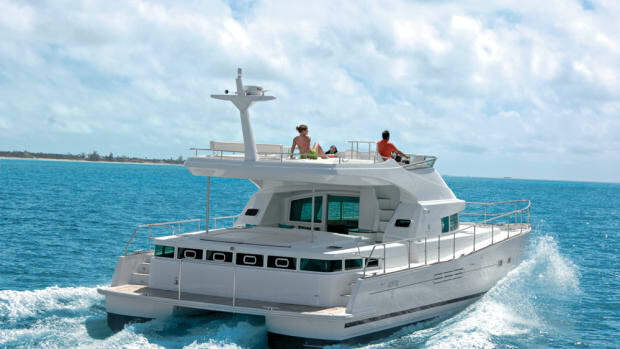 Between the entry door and the helm are an efficient galley to port and comfy dinette to starboard. From the perspective of veteran liveaboards, the C100 shows smart use of space. Tucked into the port hull is a single berth for an extra fishing buddy or lots more storage when provisioning for a jaunt down island. 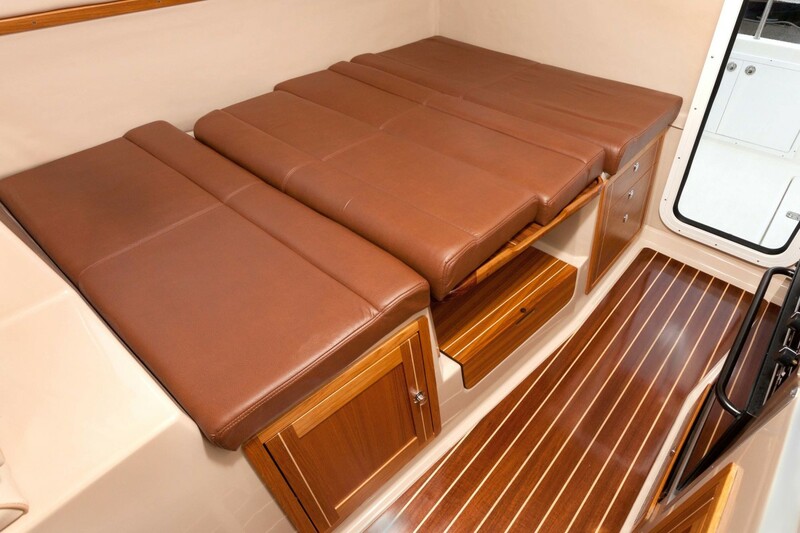 Beneath the dinette, a deck hatch in the starboard hull opens to reveal some items requiring low-frequency maintenance, including batteries, battery charger, inverter and fuel filters. This is a great dry storage location for those seldom-needed spare parts. Continue forward and starboard of the helm, down a step or two, and you have arrived in the hallway. OK, so it’s the starboard hull, but it feels like a vestibule. Turn forward, where you’ll find a king-size bed in the master stateroom, or turn aft to a roomy head. All this in a 32-foot catamaran! Despite having asymmetrical hulls and only one engine, the C100 tracks straight and true. As with everything else on this boat the hull layup is extraordinary too. All hand laid by Nordic Tug, the hull gelcoat is the CCP Premium Armorcote, a flexible UV stabilized blend. This is followed by pure vinylester Hydrex for the first layer of fiberglass under the gel coat. The vinylester layer helps prevent water intrusion and acts as a barrier coat. Then above the water line a 3MM Coremat with an ounce and a half of mat under and over is followed by alternating layers of mat and 18 oz. woven roving. Each layer is carefully squeegeed of any excess resin. Some hull sections have up to 5 layers of 18 oz. woven roving. This procedure is used to eliminate the show-through effect of using thicker 24 or 36 oz. glass and trying to fill in the pockets with more resin. The goal of Aspen is to provide a higher ratio of glass to resin giving you a stronger more resilient boat. The hull thickness is 3/8” above the waterline, 1/2” near the waterline and it is 5/8” thick near the keel. Both catamaran hulls have a Divinycell inner hull composite 1 1/2” thick adding more strength and giving a double bottom effect. Additionally the bows have a layer of Kevlar making them impact resistant and proud to carry a 10-year warranty. Five bulkheads in each hull (two are solely structural) provide three watertight compartments, each with bilge pumps. The hull to deck fitting is a “shoebox” fit, meaning the deck mold fits over the hull mold just like a box top would. An aluminum backer plate is bonded into the hulls’ top inside edge and the fiberglass deck cap is joined and sealed with aircraft grade urethane adhesive. Then everything is screwed down every three inches with stainless steel screws. The final fitting includes knitted biaxial material glassed over the inside of this joint everywhere accessible. This kind of attention to high quality craftsmanship is evident in the smooth and quiet ride. So now that we’ve detailed the creature comforts, we’ll attempt to explain the science behind this design. 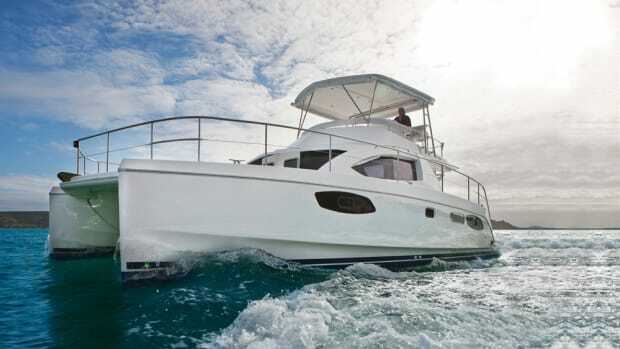 And we suggest that you not only trust us but also verify with a sea trial yourself one day. It’s an amazing ride in so many sea conditions. We probably zinged you when we reported there is only one engine in this catamaran and yet she still rides straight and true. We were doubting Thomases ourselves, as many who know us will confirm. So to start the explanation, think Hawaii. 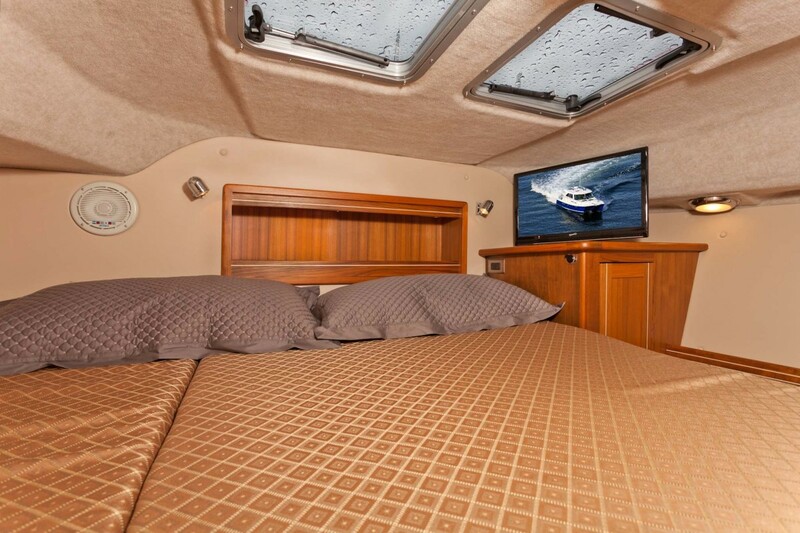 A king size master stateroom occupies the beam of the C100. This cat design concept is similar to the South Pacific proa, a sailboat with a second smaller hull or outrigger. 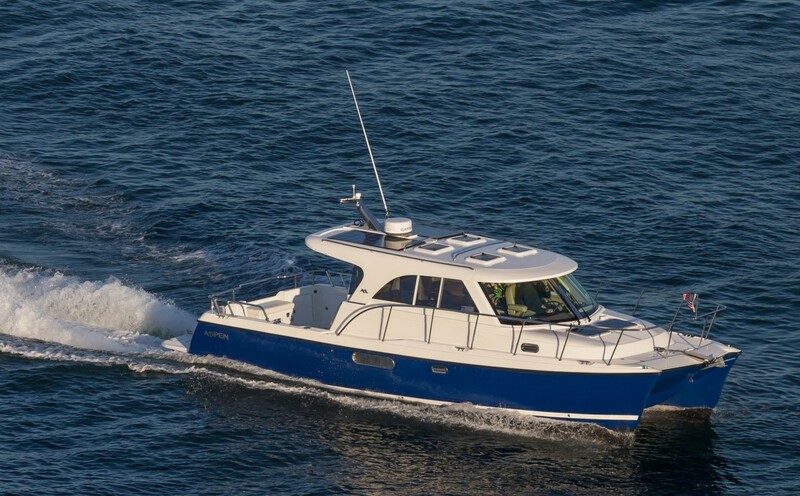 The smaller hull provides stability with less drag for the larger hull, and this design allows straight-ahead steering with no directional skewing. 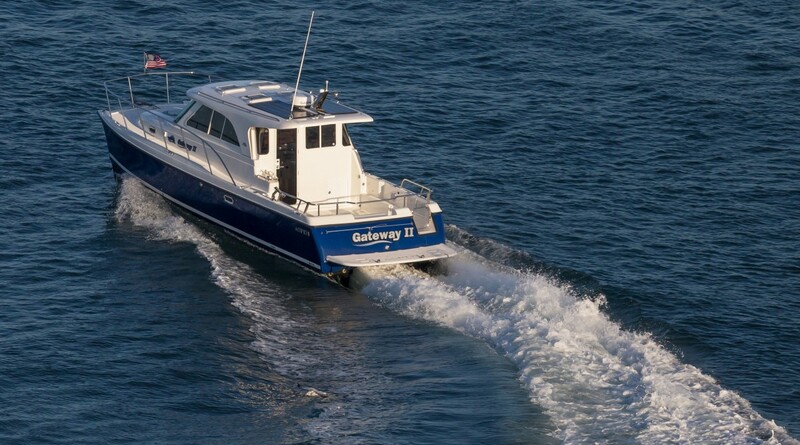 Even in a following sea, which we experienced during part of our time at the helm aboard the C100, this extraordinary little power cat pressed on like a knife through butter, rare for most displacement hulls. We took turns at the helm, and both of us had to admit that the cat handled better when we set a course and kept our hands off the wheel. She intuitively knew how to ride the waves. Anyone who has operated a twin-engine trawler using only one engine knows the boat won’t drive straight without significant rudder correction. The starboard engine will skew the boat to port when the port engine isn’t running. This is not the case on the Aspen C100, because the two underwater hull designs and the engine torque counteract each other and keep the boat on a straight course. The starboard hull’s single engine will walk or back the Aspen to port in reverse, just slightly. (This is opposite of traditional single-engine trawlers, which usually walk starboard in reverse.) To compensate for this, the Aspen walkway for docking is on the port side. 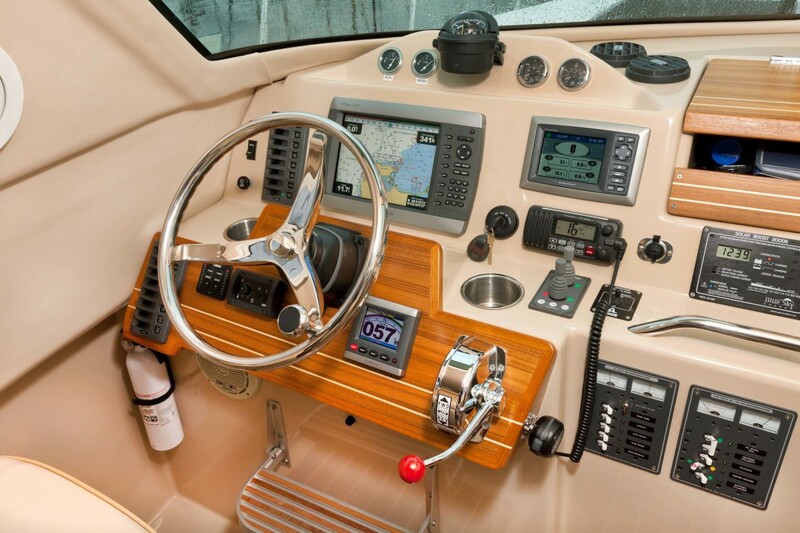 The location of a midship cleat and window next to the helm seat makes line handling comfortable for singlehanders. To aid in docking the Aspen comes with Side-Power bow and stern thrusters as standard equipment, also located in the starboard hull. 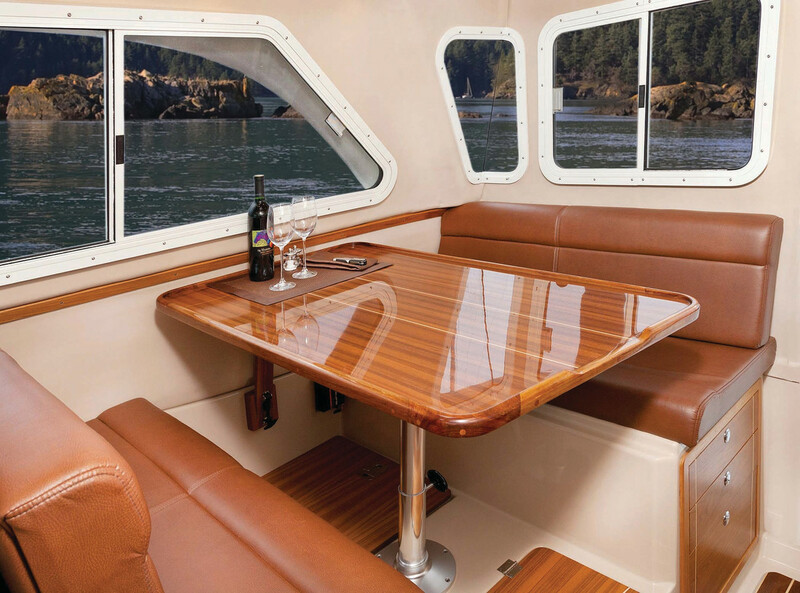 A large dinette occupies the space behind the helm. Another interesting fact is that the Aspen is not a planing boat. She is a displacement design, giving you the speed and comfort you appreciate while riding in the water—not bouncing across the top of the waves like most go-fast boats. 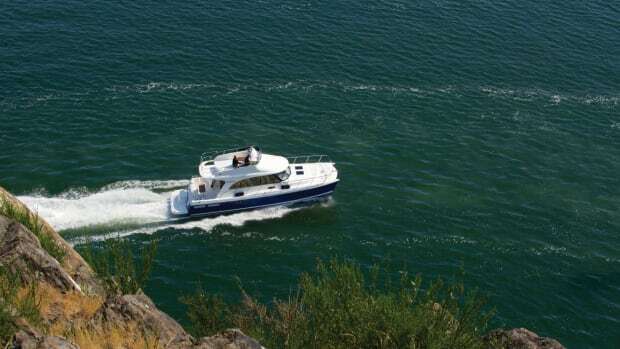 The single Volvo diesel cruises economically at 20 knots and can top out over 30 knots! Our bias as slow trawler owners had us prepared for a jolting ride when her speeds increased, but not so, even when we got out into a good chop on top of some sizable swells. This adds up to less fatigue on the captain and crew, and a more enjoyable day in the ocean. You can’t beat that. While talking about propulsion designs, Larry Graf described the unique get-home power system for the Aspen. Since all cruising boats have a dinghy to get ashore from an anchorage and that dinghy has an outboard motor, why not design a removable bracket under the swim platform to mount that outboard for backup propulsion assistance? Don’t laugh; this can work. We have pushed a 46-foot ketch down a fairway and into a tight slip using our dinghy with a 9.9hp Mercury outboard. Our marina neighbor has his small outboard on a transom bracket that lowers to give him get-home ability on his single-engine, 36-foot, full-displacement trawler. It does work. The Aspen has more surprises waiting to be discovered. The base boat offers an optional generator, but you may not need one. A 12VDC air conditioner will cool the boat down on a hot summer night and can be installed to operate from your battery bank. The batteries will recharge from the 150-amp alternator on the propulsion engine once you get back under way. 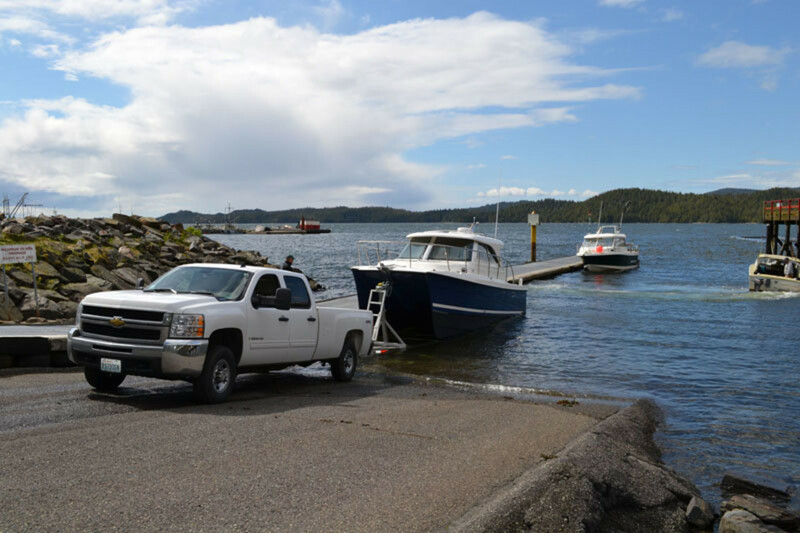 Then, when dockside, you can plug into shorepower and continue enjoying the comfort of air conditioning while the battery bank is replenished by the inverter charger. An additional battery charging system can include two solar panels mounted on the cabin roof. If you want to be prepared for those chilly nights in the Pacific Northwest, a diesel-fired heater is available, as well. The dinette can convert to a queen berth if owner&apos;s decide to share in the adventures. During our sea trial, we ran with four people aboard, 60 gallons of fuel, a full 50-gallon water tank and fair weather. Sea conditions varied from flat calm just outside the marina to a good chop with swells from the tugboats operating in the area around Guemes Island. Our decibel meter was on the fritz, but noise was never a concern while under way, even at top speeds. The four of us conversed like we were sitting back at the dock. The fiberglass hull interior of the C100 is soundproofed with foam insulation, and the engine compartment is outside the rear cabin bulkhead, helping mitigate engine noise. We experimented with different angles of approach to tug wakes to see how the boat would right herself after crashing across tall seas. Hmm…no crashing. As Larry had promised, the two hulls pierced the wakes. We felt buoyant upward forces but did not pound like a planing boat would. We ran at WOT (wide-open throttle) for a few minutes to steer hard over port and then starboard, and the boat rode steady. She did not throw us around the saloon cabin, or make us feel uncomfortable. It’s a smooth ride at any rpm. A rare feature for trawlers, the C100 is easily trailerable. Today’s trawler market includes “trailerable trawlers,” and the Aspen C100 fits well into that concept. 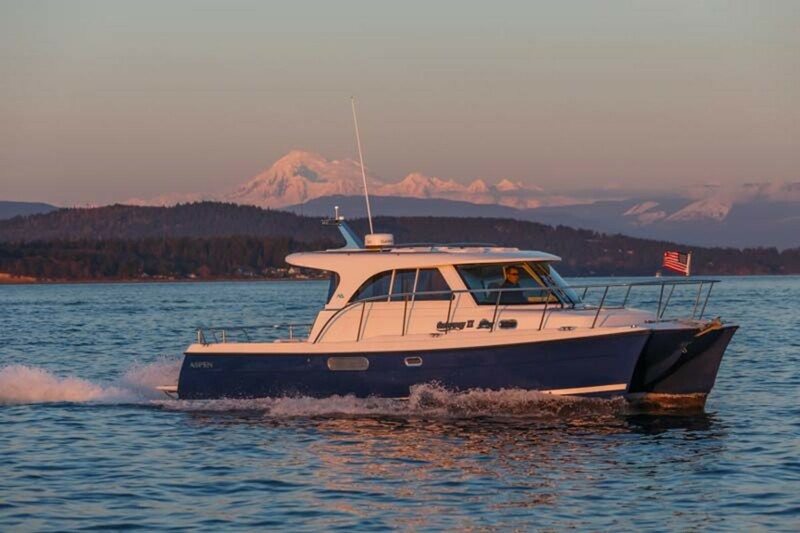 You can purchase the Aspen near the factory in Snohomish, Washington, and cruise the San Juan Islands and Pacific Northwest. As fall approaches and a chill grips the waterway, simply hitch up your trailer or hire a trucking company to haul your boat anywhere in North America for your next adventure. Think of cruising the Chesapeake, or maybe winter in the Florida Keys and Bahamas before heading back to the West Coast in the spring. This seaworthy 32-foot catamaran is fit for any waterway, and her low profile is perfect for navigating under the bridges of the Great Loop. In this traditionally monohull world of trawlers, the Aspen C100 proa cat can certainly run with the big dogs. Nice kitty. We ran the Aspen C100 with four people aboard, 60 gallons of fuel, a full water tank(50 gallons) and fair weather, with sea conditions varying from flat calm to choppy with swells. 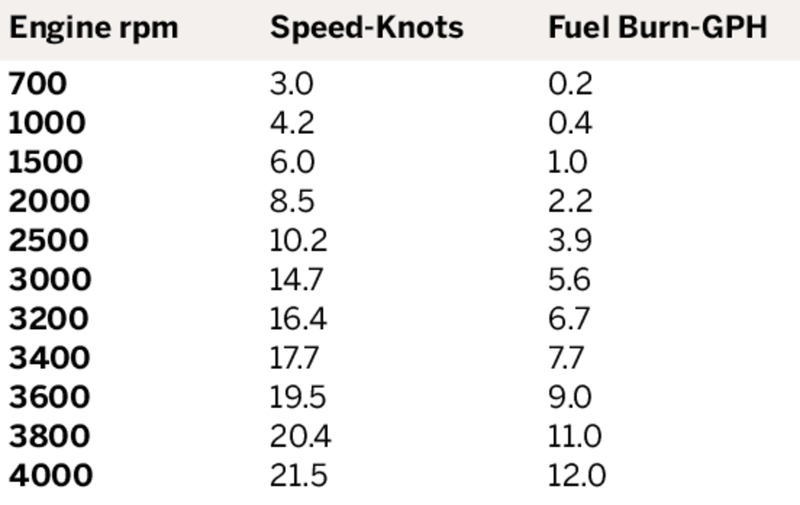 The fuel consumption rates and speeds listed were viewed on the dash-mounted Garmin GPS 5208 and Volvo Penta engine panel. Water Tank 50 U.S. Gal. Holding Tank 30 U.S. Gal.